Guangzhou Miracle Heat Transfer Materials Co., Ltd. is a high-tech enterprise dedicated in the r&d, production and marketing of thermal transfer mechanical equipment. It is committed to providing customers with high-quality products and complete heat transfer solutions. Our products include heat press machine, 3D heat transfer machine, cutting plotter, thermal transfer film, thermal sublimation ceramic products, thermal transfer blank consumables, thermal transfer fabrics as well as other thermal transfer gifts and consumables. Since its establishment, the Company has been consistently adhering to the business principle of integrity orientation, and dedication to customer service. Thanks to the gathering of industry elites and the constant introduction of advanced information technology as well as the complete supply chain management, it has established the strategic partnership with domestic and foreign enterprises, with a view to provide customers with the comprehensive thermal transfer solutions and more advanced industry knowledge, and to improve their marketing capabilities as well. With the adherence to the concept of “quality first, reasonable price, fast delivery and dedicated service” and the priority of customer needs, it focuses on manufacturing all products well so that customers can remain competitive in the fierce market competition, so as to further achieve the rapid and stable development of enterprises. 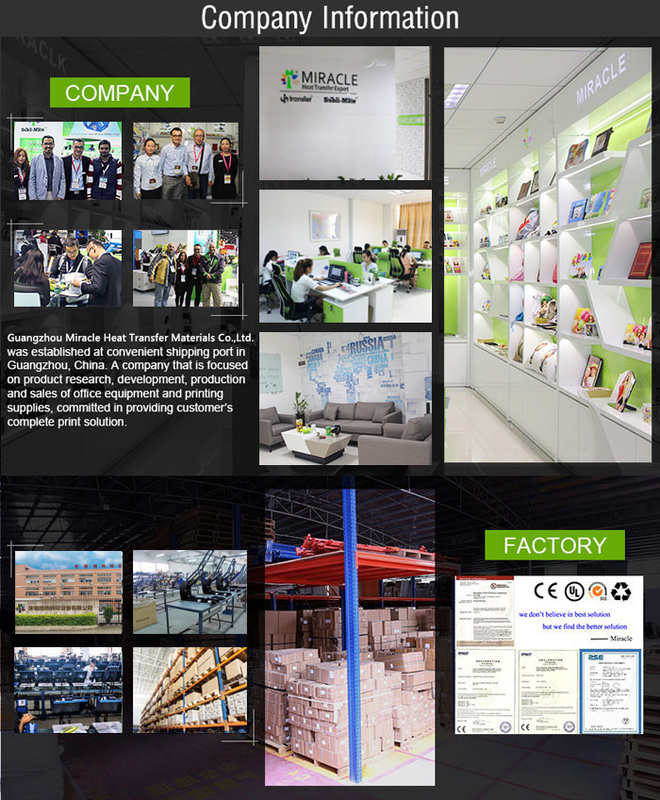 The recent years have witnessed the rapid expanding of customer base of Guangzhou Miracle International Trade Co., Ltd., and its products have been sold to various countries around the world. The Company boasts with technology, r&d and procurement teams with the accumulated experience of a decade in the heat transfer industry. It also has the thermal transfer equipment plant and thermal transfer coating plant, as well as the professional foreign trade warehouse. Thanks to the accumulation of a variety of market resources, it excels in the product market and keeps update to the latest developments in the market, so as to continuously offer new thermal transfer products and solutions to the customers and be committed to becoming your most reliable long-term partner. Mission: To become the premium supplier of customized gifts through our professionalism, social responsibility and customer-oriented service. Vision: To create more value for customers and make a better life by providing customers with complete solutions. Company slogan: Seek perfection from better solutions. Core Values: We believe we will achieve the constant innovation, r&d and breakthroughs through our respect and responsibilities to customers. We will manage all aspects of our business in the spirit of honesty and integrity as well as the sound business ethics. Goals: To grow together with customers, and strengthen the Company's strength; to create favorable reputation in the field of customized gifts and to become the industry leader.